I eat this for dinner on the weekend. I’ve been eating it for months. I can’t stop. I’ve learned not to be impatient when roasting sweet potatoes. I’ve learned that salt in refried beans is a mistake. I’ve learned that I can’t live without Cholula hot sauce. Sometimes I share the sweet potatoes and avocado slices with Elliot. Sometimes I make one for Jake to bring to work. Sometimes I buy a pink table from my favorite antique store. Sometimes it loves quesadillas as much as I do. Just know, that this is the tastiest quesadilla I’ve ever met. 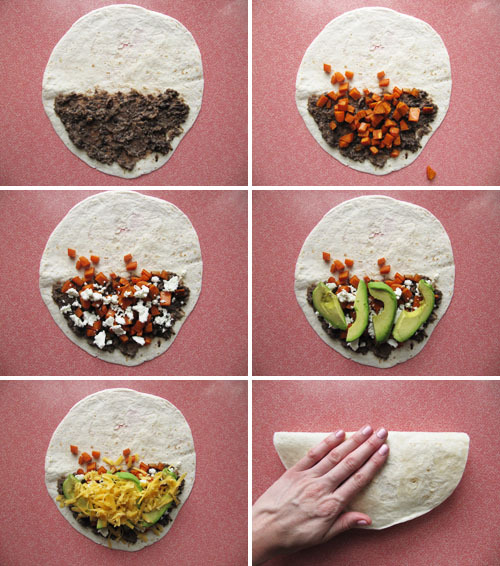 I love it even though some people think they’re just flat burritos. Preheat oven to 425°F. Line a baking sheet with foil. Toss sweet potato cubes with olive oil, salt and pepper, making sure every cube is evenly coated. Pour onto the prepared baking sheet so that they’re in a single layer. Place in the oven for about 40 minutes, mid-way through roasting take them out and stir them a bit on the sheet. 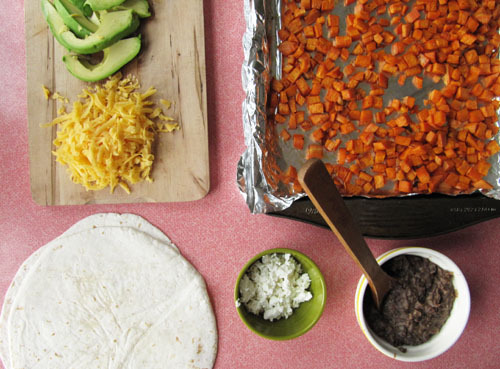 While the sweet potatoes are roasting, make your refried black beans. 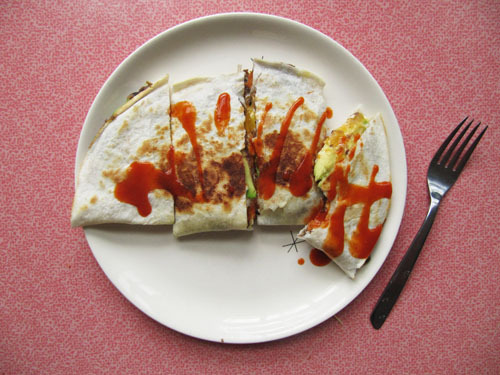 When the potatoes are crispy and roasty-toasty-good, assemble the quesadillas. Spread the refried black beans on the bottom half of all four tortillas. Top with sweet potatoes, goat cheese, avocado slices, and cheddar. Fold over and press together. Spray a large skillet or grill pan with cooking spray and warm over medium heat. Place the quesadillas on the pan and heat until crispy and cheese is melty. Flip and cook until the opposite side is crispy as well. Transfer to a cutting board. Slice and serve with hot sauce and salsa. Ingredients for one dreamy dinner. Pour the beans into a medium bowl. Using a potato masher, mash beans with their liquid, into a coarse puree. Heat oil in a medium sauce pan. Add garlic and cook until fragrant, about 1 minute. Add black beans to the pan and stir together mashing with the back of a spoon. Continue to cook, stirring occasionally until hot. Season with spices to taste. Remove from heat and set aside until time to assemble quesadillas. 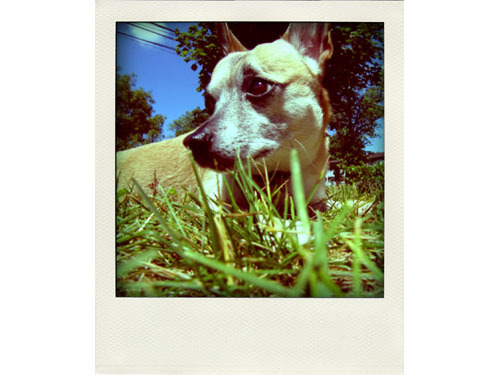 Here’s Elliot laying in a grassy knoll (the backyard) lovin’ life. i definitely ate a sweet potato hash and cheese burrito w/ cholula the last three days for lunch. same food brain, i swear. also, thrifting/antiquing is the best. i love your pink table. You KNOW that I think these are supper spiffy!!! 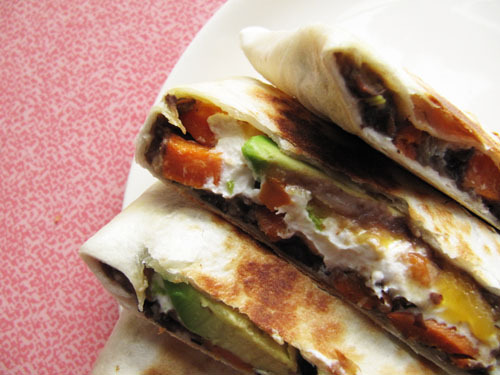 Wow, these quesadillas look amazing! I’ve always loved sweet potatoes, and lately I’ve been on a bean kick. I think I’ll have to make these very soon! Looks sooo good. We love quesadillas. Gotta try this variation. wow- i found your blog from looking at Beckie’s (Movies of myself) and this recipe looks right up my alley- making it for lunch now- thanks! I made this for dinner tonight and it was awesome! It was really easy to make too, which was nice. I’m so glad I found your site. Your photos are wonderful and I can’t wait to make more of your recipes! I made this recipe the other night and I have to say, I love this flavor combination! I’d never tried goat cheese on a quesadilla, and it was so creamy and delicious, and helped to hold everything together. Thanks for the ideas!